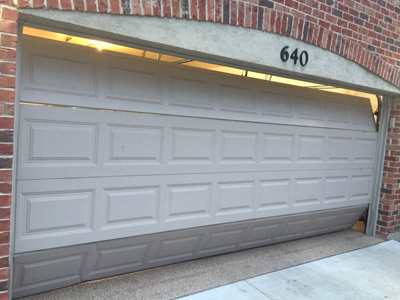 Blog | When is it Time for a New Garage Door? When is it Time for a New Garage Door? Peeling or cracked paint on wood doors– If you observe that your door has peeling or cracked paint, this may already require a replacement. Doors made of wood need to be refinished periodically to protect it from the elements. However, the stained or painted finish can break down over time. When this happens, the wood will start to rot. If you observe that your door has holes or there is moisture, it is time to replace it. Dings and dents on your steel door– Another sign to look for would be dings and dents. These are commonly found on steel garage doors. Dings and dents can impact the appearance of the door and if they cannot be repaired, it is time to get your door replaced. 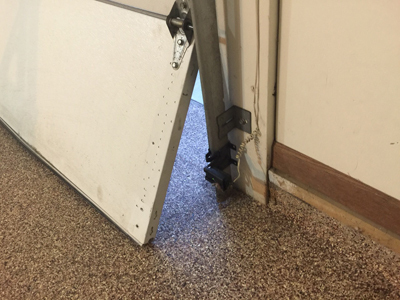 Sagging and bent doors – Doors that are not properly maintained have a tendency to sag over time. If your door starts to sag, you will see that there is a gap at the bottom when the door closes. If this is the case, you need to replace it. Rising energy bills – Rising energy bills are another sign that warrant the replacement of your garage door. Old garage doors may not be well insulated and this contributes to the increasing energy costs. Thus, they need to be replaced with insulated and sealed garage doors. These are some signs that help you ascertain if your door needs replacement. If you have observed one or two of these signs, we at garage door repair Freeport recommend replacing your door.